Custom polyester mesh banners are durable and lightweight. Any design can be printed making these very versatile for adverting and great signage for sporting events. We digitally print our poly mesh banners using UV inks that last, our mesh material is guaranteed not to rip or tear. 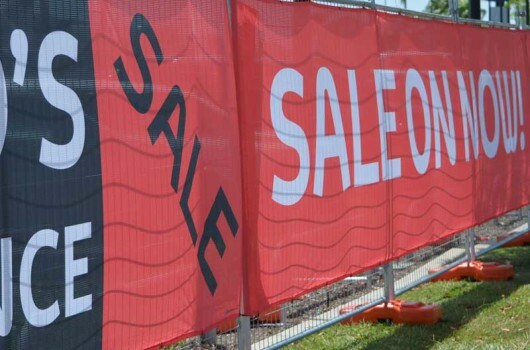 Banner mesh signs can easily fit to portable and temporary fences making is very useful for sporting events, building sites and festivals. Your designs are not limited we are able to printed any photos or designs you many have. The length can be printed to any size. Digitally printed with UV protection inks. Four rows of stitching, hemmed each side. Photos or standard artwork can be printed. Production time for small orders 5-7 days. Larger orders will be confirmed at quoting stage.